I'll be honest, I was quite surprised when I was asked to photograph a wedding at the house in which the Queen Mother was born and lived as a child. As you can imagine, the former home of the Queen Mother is impressive to say the least, but it's nothing compared to the gardens - all 50 acres of them. What's most amazing, is every one of those 50 acres is immaculately maintained. 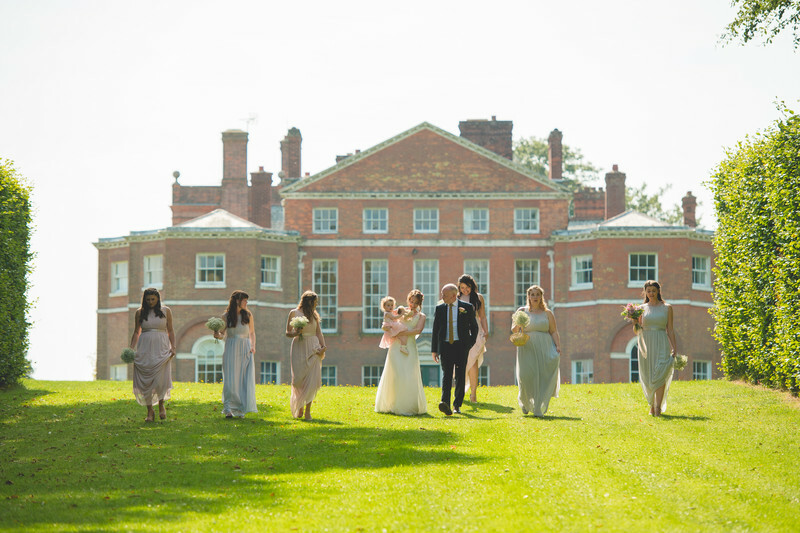 St Pauls Walden Bury has a licensed room within the main house for wedding ceremonies, as well as two temples in the gardens that are available for use too. It was one of these temples that Emily and Kyle decided to have their outdoor ceremony at. In more than one locations on this website, I speak about how openly happy I am to help clients with the planning of their wedding photos. I've even written a small article about it. I drove the 120 miles to meet with Emily and Kyle with the view to having a look around the venue as I'd not been there before, but also to help plan how they could make the most of their wedding day when it comes to photography. The first thing we chose was which of the two temples we'd use for the ceremony, and we chose one at the far end of a garden instead of one that was smaller and backed out onto a lake. One of the best decisions we made was how the bride, Emily, would make her grand entrance with her father. Leading away from the temple was a 600 metre long walk, lined on either side by perfectly straight trees. From the main house to the temple there was a path that cut across the gardens diagonally, meaning the bridal party could appear 200 metres from the ceremony location. 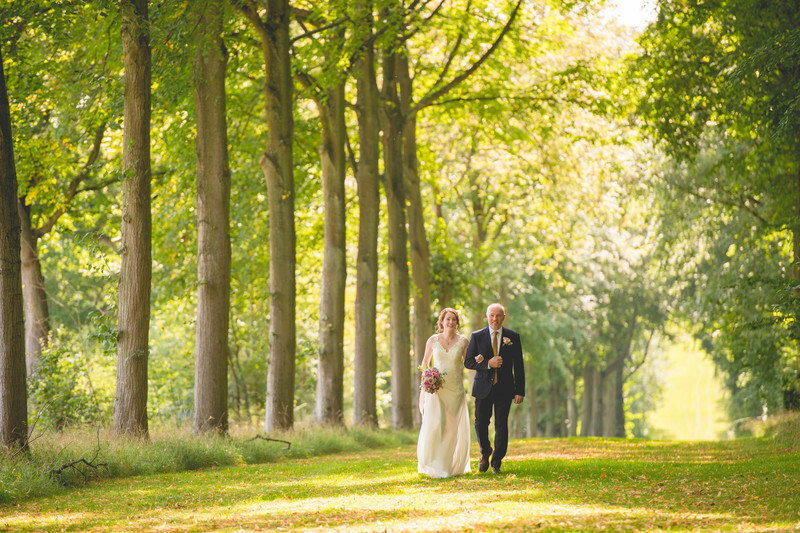 It was the hottest day that I had ever photographed a wedding on, reaching a scorching 32 degrees centigrade in the afternoon, but we were lucky in that the trees provided a great deal of shade. 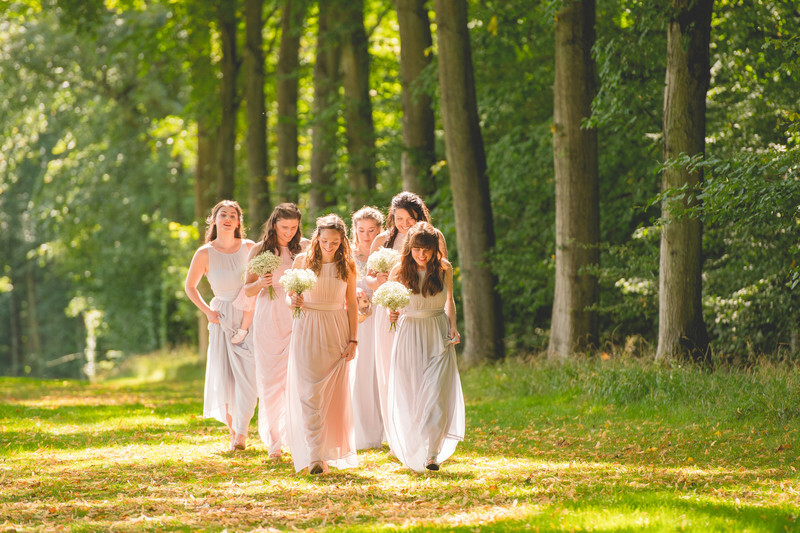 Mottled sunlight bled through the trees which produced some beautiful images of the bridal party walking to the ceremony. Location: St Pauls Walden Bury.